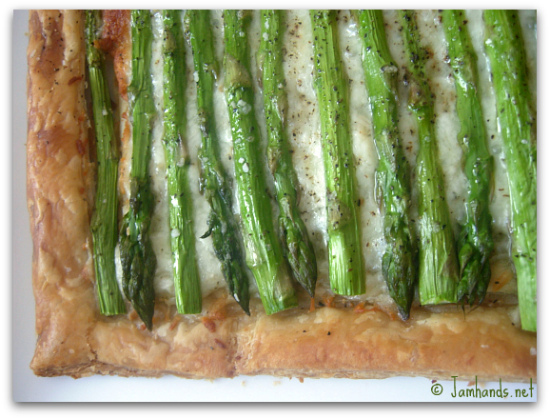 I came across the original recipe for this Asparagus Gruyere Tart from 'Chefanie Frasco' at The Chefanies while participating in a fun little foodie event, the Secret Recipe Club, which was created by Amanda at Amanda's Cookin'. My host who is organizing my group for this month is Tina from Moms Crazy Cooking. Thank you Tina for hosting! The Chefanies is a combined blog of two ladies named Stephanie. In their words, "This blog is our spot to share our favorite recipes and the stories (and people) behind them. We try to use only organic, seasonal (in California terms) and fresh ingredients." Right off the bat, I was impressed by their colorful banner for their blog title, contrasted to the clean and fresh white background of their website. It is orderly and clean, which is exactly what inspires most people to get in the kitchen and cook. As I browsed through their recipes, it was clear that The Chefanies value fresh, local produce. I considered quite a few recipes to make, including the Chopped Heirloom Salad with Spicy Ranch, Strawberry Feta Salad, and the World's Greatest Cheesecake. I happened to have half of a package of puff pastry ready to be used up and the Asparagus Gruyere Tart was calling to me, so off I went! I made one substitution, which was the type of cheese I used. Ideally I would have loved to use Gruyere, but I ended up using a mix of fontina, Parmesan, provolone, asiago and mozzarella. Even though I had to use my second choice for the cheese, it turned out so delicious. This is a simple and delicious recipe for cheese and vegetable lovers alike. Ready for the recipe? I went a little snap happy when I was taking the pictures. I couldn't help myself! That's an appetizing tart, I'd love to try it out! 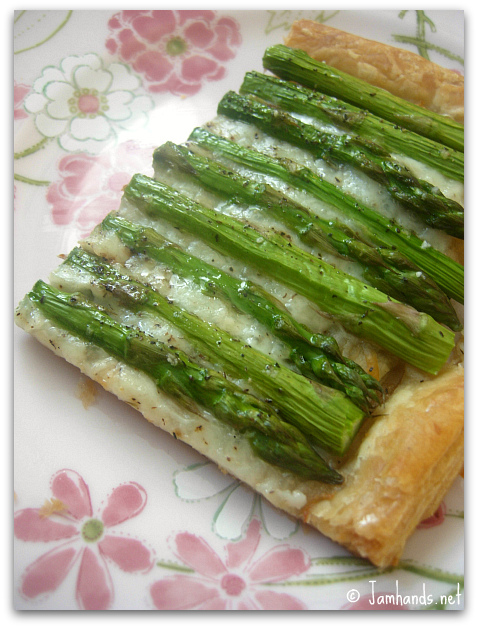 mmmm, asparagus tart!!! One of my favorites! I love asparagus! This looks like a winner, Ali! This looks delicious! Love your blog! Wow. that looks incredibly tasty and (very professional). The kind of thing you can make in one big batch and then cut up to serve at a party. This looks delicious. I bet this would look awesome cut into bite-sie pieces for a party. I had the Chefanies last month and it was such a fun blog to look through! Your tart looks so delicious. I bet the mixture of cheeses was even tastier than the Gruyere would've been. Such a stunning looking tart. This tart sound delish! You did a great job on it...excellent blog post too! I'm a new follower! My mom is a huge asparagus fan. She would love this recipe! Wow what a great job! That looks so good!!! What a beautiful tart. It would make such a great dish on a brunch buffet. Great choice in recipe!! Your photos turned out great. It was so much fun having you this month!! Have a great day! Oh my yum! What a perfect summer meal. This recipe really is SO cute! I love the way the asparagus looks! My twins love asparagus too! We may just have to try this! Thanks again for being a part of SRC and thanks so much for the mention of MOMS CRAZY COOKING! I just now finished linky everyone and organizing and now I get to visit everyone's blog, THIS IS THE FUN PART! Love this tart- can't wait to try it out. Looks scrumptious! I love, love asparagus! 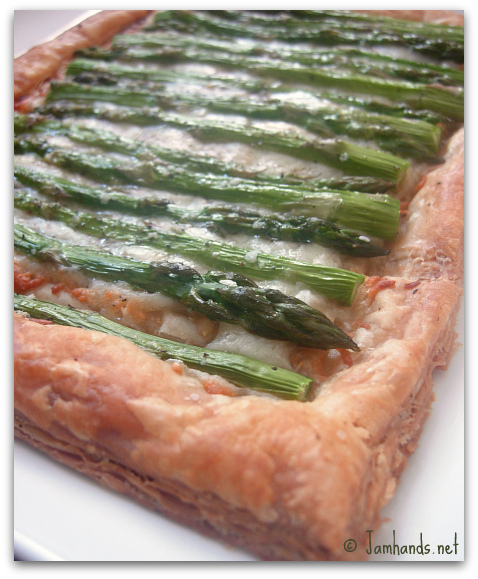 That looks very fancy - and asparagus, cheese, and pastry are three of my faves! It's so pretty! I love recipes that utilize fresh produce. That looks so great. Is there anything better than fresh asparagus? Oh! How delicious does this look? 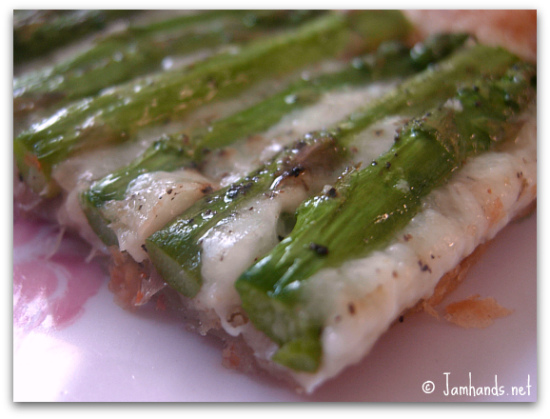 My goodness that melty cheese, with those beautiful, vibrant asparagus - my favorite veggie. Looks SO good! Beautiful! I love everything with asparagus!! Yum, yum, yum...one of my favorites! Stunning tart! 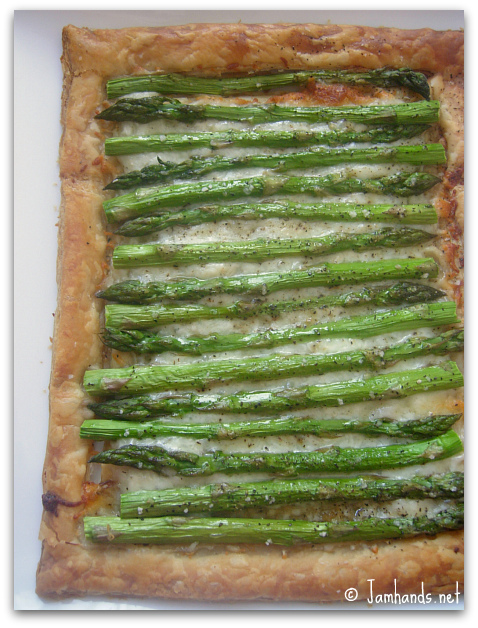 The whole asparagus spears have such a cool visual impact surrounded by the flaky puff pastry. And I love how simple it is too. Great SRC pick and your photos are beautiful! Will be flagging this recipe for future use. I was browsing through the recipe reveals from SRC and this tart immediately caught my eye...it is stunning! Really is simplier to do than it looks! I have to make this! I made this tonight for dinner... Very easy and relish! I added prosciutto under the cheese and added a few sautéed purple onion strings. Yummo! Will be a keeper!! freelulu - I'm so glad to hear you enjoyed it. Your additions sound wonderful. This makes my mouth water! Definitely bookmarking it! Love how quick and easy yet elegant this recipe is! This was a huge hit with my German friends on my birthday! Thank you! Since the puff pastry is cooked initially, how do you keep it from overcooking when cooking the asparagus for another 25 minutes?